Zach “Bug” Lokken of Durango works around a gate during the U.S. National Junior Trials on the Nantahala River in North Carolina earlier this month. Lokken earned the top spot on the U.S. Junior National Team in C1. He's known, affectionately, as "Bug." He's also known as the top canoe paddler on the U.S. Junior National Team. Zach "Bug" Lokken of Durango Whitewater earned the top spot on the U.S. Junior National Team after two days of whitewater slalom races earlier this month in North Carolina. 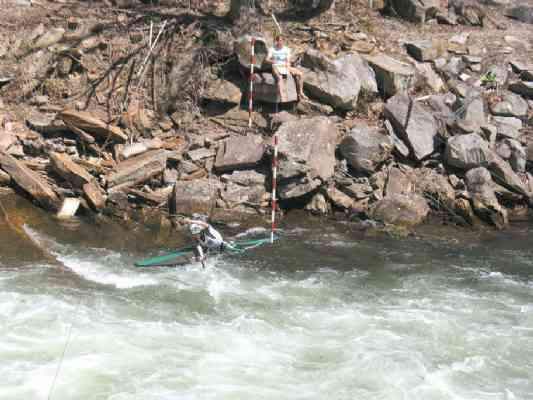 Lokken, 15, outraced the field during the national qualifying races on the Nantahala River. A freshman at Durango High School, Lokken is part of a Durango boating family that includes mom and dad (Angela and Eric) along with older brothers Wil and Josh. With his designation as the No. 1 paddler in C1 (canoe single), Lokken earned a trip to Foix, France, to compete in the Junior Pre-Worlds in June. "I haven't been to France, so this should be really fun," Lokken said this week in an interview. The Durango boater has international racing experience. But this will be his first time to race against an international field in France. Lokken said in North Carolina the competitors had two runs on each of the two days of competition. A boater's best time from each day was used to determine the winner. The canoe paddlers (and kayak paddlers in the other divisions) had to navigate a series of gates in the Nantahala. There was a 2-second penalty for touching a gate and a 50-second penalty for missing a gate. "On the first day ... I had a good day," Lokken said. "On the second day ... I was a lot better." He said the water was really good for the competition. "It was bumpy sometimes. It was mellow at the top. Then there was a big hole that was pretty challenging," Lokken said. His ability to handle the difficult hole helped push him to the top of the 30-canoe field, Lokken said. The Durango native said his training includes sessions in the gym, where he focuses on upper body and core exercises. But his favorite training is in the canoe (a kayak with a single-blade paddle). "Most days, I'm out on the water," he said. But what about that nickname? The family reports two versions of the history of "Bug." His mother said that as a small child he used to wait by the old outdoor Durango swimming pool for his older brothers to finish a swim class. He was fond of playing with the ants in a nearby anthill. "A lady who watched him play started calling him 'Bug,'" Angela Lokken said. "I thought it was cute ... and it stuck." The nickname, according to his father, came from Bug's first spoken word. "It was the first word he said," said Eric Lokken with a chuckle, who added that the family enjoys the different versions of the lineage of Bug's moniker - a nickname he's had at least since 3. Regardless, when he gets to France, "Bug" will be known as "Bestiole." "It was mellow at the top. Then there was a big hole that was pretty challenging."